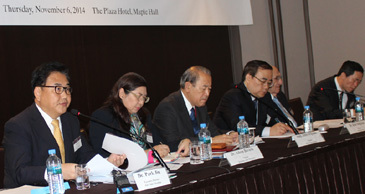 Chair Prof. Park Jin (left) of Hankuk University of Foreign Studies presides over Asia Foundation Roundtable held at Plaza Hotel in downtown Seoul on Nov. 6, 2014. A leading Chinese academic has predicted that “it is likely that China will overtake the United States of America as the world’s largest economy as a half-superpower” at a conference on US rebalancing policy at the Plaza Hotel in Seoul on Nov. 6, 2014. Dr. Ren Xiao is a professor in international politics at the Institute of International Studies (ISS) in Shanghai. He made the remarks during a roundtable discussion hosted by The Asia Foundation about President Obama’s new Asia policy. 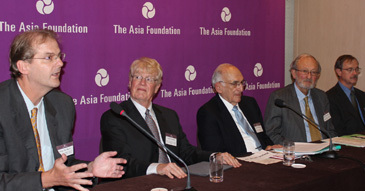 Dr. Peter Beck introduces former Asia Foundation representatives in S. Korea at Asia Foundation Roundtable held at Plaza Hotel in downtown Seoul on Nov. 6, 2014. But he reassured the panel, moderated by Chair Prof. Park Jin of Hankuk University of Foreign Studies, that other Asian countries should have nothing to fear from China’s resurgence. “I am confident of the Chinese leadership as they have the region’s best interests at heart,” he said. However, keynote speaker and Asia Foundation chairman David Lampton believed that a partnership with China may not be easy. Ex-Justice Minister Kang Geun-Shil (2nd from left) speaks at gala dinner held at Plaza Hotel in Seoul on Nov. 6, 2014 on the osscasion of Asia Foundation's 60th anniversary. Second from right is recently arrived US Ambassador Mark Lippert . Former Asia Foundation representative in South Korea, Dr. David Steinberg noted that the Chinese saw their relationships and formulated their policies from different viewpoints. “Think about the nationalism in the US, especially since 9-11 and that has an influence in American policy,” he said. The former Japanese Ambassador to the US Ichiro Fujisaki claimed that the China will not overtake the US in every sphere. 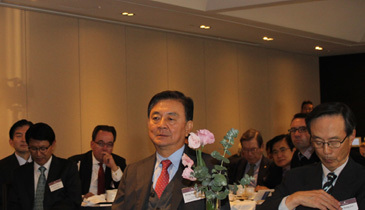 Chairman and CEO Hong Seok-Hyun (center) of the JoongAng Media Network attends the Asia Foundation roundtable held at Plaza Hotel in downtown Seoul on Nov. 6, 2014. Ambassador Ichiro also urged the partners in any future policy not to spring any political surprises on each other in a spirit of friendship, especially in dealing with the emerging superpower of the People’s Republic of China (PRC). “It is important we have to recognise other partners. The PRC is important. I am talking about patience, consideration and a positive attitude,” he said. 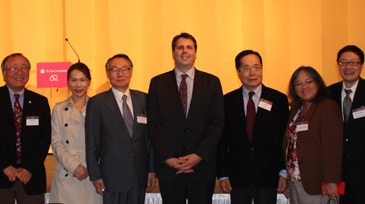 US Ambassador Mark Lippert (center) poses with Chairman Kim Jong-Ryang (3rd from left) of Hanyang University's board of directors, with Kim's wife Mrs. Choi Kyung-Won (2nd from left), and with Chairman Yun Ik-Han (3rd from right) of The Seoul Times. At far right is Minister-Counselor for Public Affairs Robert W. Ogburn of the US Embassy in Seoul. To his left is his wife Mrs. Ogburn. The next speaker was Dr. Kim Sung-Han, professor at Korea University’s Graduate School of International Studies. He felt that US as a superpower wanted other countries in Asia to be more competitive. “The US is showing interest in regional competition,” he said. But he thought that resumption of the Six-Party talks including North and South Korea, Russia, Japan, China, and the US could result in the formulation of regional peace forum and warned about the consequences of going against this treaty. The only female panellist, and the only representative from one of the smaller Asian nations, was Dr. Aileen Baviera, professor in political science at the University of the Philippines Diliman. She raised concerns over the increased military presence of the US in the region. 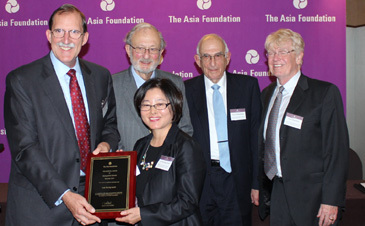 TAF President David Arnold presents an award to the Asia Foundation, acting representative Lee Kyung-Sook during a ceremony held at Plaza Hotel in Seoul on Nov. 6, 2014 on the occasion of Asia Foundation's 60th anniversary. “There should be more than mere consolidation of US military power,” she added. The event commemorating the 60th anniversary of The Asia Foundation (TAF) was rounded off by speeches by their former representatives in South Korea, including Dr. Steinberg, who first served there more than 50 years ago, and Peter Beck, who held the post most recently. For her 30 years’ service to the Asia Foundation, acting representative Lee Kyung-Sook was given the presidential award by TAF President David Arnold. In the evening she acted as master of ceremonies at the anniversary dinner held in the Grand Ballroom of the Plaza Hotel in downtown Seoul. 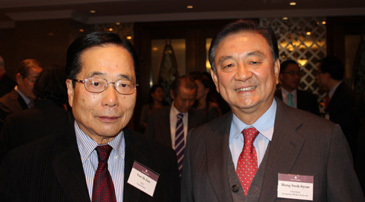 Chairman Yun Ik-Han (left) of The Seoul Times poses with Chairman and CEO Hong Seok-Hyun (center) of the JoongAng Media Network at the Asia Foundation roundtable held at Plaza Hotel in downtown Seoul on Nov. 6, 2014. Chairman and CEO Hong Seok-Hyun of the JoongAng Media Network gave an opening speech before dinner commenced. He is also the honorary committee co-chair for TAF. 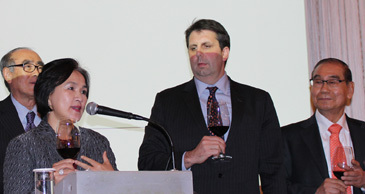 Also attending was the new US ambassador to South Korea Mark Lippert who was making his first public appearance since starting the post. He took part in a congratulatory toast to close the evening. The Asia Foundation is a non-profit international development organization committed to improving lives across a dynamic and developing Asia. Their programs address critical issues affecting Asia in the 21st century—governance and law, economic development, women's empowerment, environment, and regional cooperation. In addition, their Books for Asia and professional exchange programs are other ways in which they seek to improve the lives of those living in Asia. In 2013, they provided nearly 114 million US dollars (around 124.5 billion won) in direct program support and distributed textbooks and other educational materials valued at over 10 million US dollars (around 11 billion won). The foundation has seen South Korea undergo a dramatic transition in recent decades, developing into a powerhouse economy and robust democracy. Now, the country is poised to share the lessons of its own transformation from aid recipient to donor. Their office in Seoul works to strengthen the capacity of South Korean government agencies and NGOs, promotes international exchanges with North Korea, and facilitates regional cooperation in Northeast Asia.